Ken Sparks doesn’t remember every word of every speech at the dedication of Newhouse 2 on May 31, 1974. But he does remember how important the building was not only to Syracuse University, but also to all of broadcasting. “You knew that this already distinguished school was going to go on to even greater significance,” says Sparks, who represented graduate students at the dedication 40 years ago. Sparks earned an undergraduate degree from the College of Visual and Performing Arts in 1954, and master’s and doctoral degrees from the School of Journalism in 1961 and 1964. The addition of Newhouse 2 not only elevated the university’s existing broadcast journalism department, it also signaled the merger of the television and radio department with the School of Journalism, creating what is now known as the S.I. Newhouse School of Public Communications. “It was nice to have the whole complex, the Newhouse School, being a fixture of journalism. And I think pulling it all together in the Newhouse School was a great thing to advance,” says Sparks, who served as executive vice president and chief executive officer of the Federal City Council nonprofit in Washington, D.C. for more than 30 years. He currently runs his own management and consulting company. 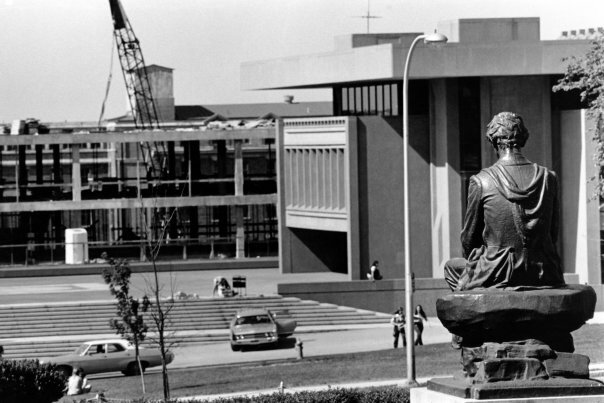 Construction on Newhouse 2 began in the summer of 1971. It was the second of a proposed three-building complex born from Samuel I. Newhouse’s $15 million donation in 1964. In 1974, the 72,000-square-foot Newhouse 2 building stood as the home of one of the top broadcast journalism programs in the country. The first two floors of Newhouse 2 housed two televisions stations, a scene shop and storage areas, while faculty offices, a 100-seat theater and broadcast laboratory were located on the third floor. 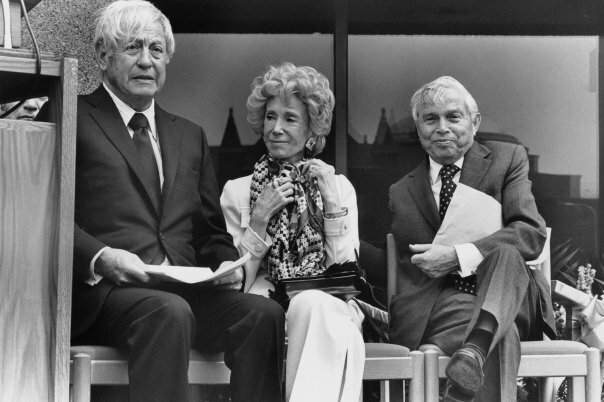 About 500 people attended the dedication, including NBC newscaster David Brinkley, who was the master of ceremonies, and William S. Paley, chairman of the board of CBS, who was the keynote speaker. Paley praised the Newhouse family in his speech, citing their contributions to communications and students. He went on to relate problems with the “Fairness Doctrine,” which the FCC didn’t repeal until 1987, to the importance of the Newhouse School: “The completion and dedication of this impressive second unit of the Newhouse Communications Center has significance that goes far beyond this moment and this campus,” he says. Eva Archer-Smith, a 1973 public relations and political science graduate, also attended the dedication, where she was invited to be the undergraduate representative. Archer-Smith worked as a senior public affairs executive for Exxon Mobil and is now an executive life coach. She says the excitement surrounding the new building and the dedication was tangible.